I’ve been ripping out my hair investigating Android tablets this weekend. The entire field is a mess. I have no idea how anyone makes a sensible buying decision that has zero degree of regret in it. Aside from the Android OS issue, and screen resolution issue, and button issue, there’s the CPU and screen type issues. CPUs are all over the map for 7″ tablets, ranging from a crappy 600MHz Rockchip to 1GHz ARMs that are usually a generation or two behind the latest one. Screens are generally resistive — so the tablets include a stylus. I thought the stylus died when Palm came out with webOS! As far as I’m able to determine, there are still only two 7″ Android tablets that are almost worth buying: the NookColor and the Samsung Galaxy Tab. They have their own issues too. The NookColor must be rooted. And investigating that is a time-consuming task. Which version of Android do you want to use? And do you want to overwrite the internal Android or just run it from the microSD card? Plus, there’s no camera. And Bluetooth, not even listed in the specs, is a hack. And then if you dare look at the WiFi-only Samsung Galaxy Tab, you have to contend with the very real possibility you’re wasting money on a crippled device. Rumor is the CPU was downgraded, highly-believable rumor is the GPU was downgraded, and owners have reported that Bluetooth was also downgraded from 3.0 to 2.1, rendering it incapable of pairing with a mouse, a keyboard, or much of anything, really. With the “best” two — NookColor and the Samsung Galaxy Tab — not being trouble-free, what people are basically left with is holding their noses and buying a craptab — a Craig, or Sylvania, a Coby, or one of the dozens of others out there. More seem to pop up every day. For $99 or so, people can experience not the pleasure of Android, as they might on a good phone, but the pain of it, with a slow CPU and a screen that needs poking with the tip of a fingernail. What a waste! And that does no good for Android’s future at all. People will think they’ve “tried Android” and flock to the iPad. It’s more expensive but it Just Works. Unfortunately, it’s also much larger. There’s no 7″ iPad. And 7″ is an important size. It’s just about the size of a mass-market paperback, which means it’s very portable. And because it’s a multifunction device, it can compete well against dedicated eBook devices with eInk screens. An Android tablet can be an ePub (Sony, Kobo, Nook, Aldiko) reader and a Kindle. This 7″ screen gap leaves people who really want Android with the new crop of 10″ Honeycomb tablets as their only real option. Which is no option at all for portability. At left is the 7″ Samsung Galaxy Tab. Behind it is the new 10″ Asus Transformer. What a size contrast! I know there’s still the HTC Flyer and the Asus Eee Pad MeMO to arrive, but I suspect both of those will have their own issues too. Both have a stylus included(!). And HTC’s is bound to have Sense on it, with could make Android updates problematic, as has been the case with phones slathered with Sense. Plus, both will be considerably more expensive — at $499 — than the WiFi-only Galaxy Tab and NookColor, further alienating them from casual buyers and making them totally uncompetitive with eInk eBook readers — as well as making them appear laughably overpriced against the 10″ Asus Eee Transformer for $399. It seems no one has come out with a straightforward 7″ Android tablet with a hi-res screen that’s basically as easy to buy and use with 3G as the iPad with a sensible price to attract many buyers. I’m sitting here wondering if anyone ever will. A webOS tablet will be superior — if the devs come over to it. Heh, not hardly. There is no way you could say this other than wishful thinking. You might want to hold off a month because there are 2 7″ Honeycomb tablets I’m aware of which are due to launch in May, and some other tablets *may* get an upgrade announcement or an upgrade. Honeycomb has only been on consumer purchasable hardware for 2 months, so I wouldn’t expect too much right now. Sure it’ll run older Android apps, but, as you say, they’re not great on a 7″ screen, and it’ll take time for developers to update their apps. One big problem for devs is that the emulator is sluggish and has bugs in it which don’t appear on real devices, so HC updates are hard work which isn’t going to get done overnight. So give it a month or three, then come back and look at things, because the ride is only just starting to roll. Well, by then the HP TouchPad should be out and this issue might be altogether moot to me. Interesting that you should mention two 7″ tablets with Honeycomb. That will be something to see! I spent my birthday tablet hunting and now you’ve sent it all to hell. I fondled a Motorola Xoom just for kicks and I can’t see myself carrying that around. Couldn’t fondle a Galaxy but did lust at it through a glass. It’s just the right size! 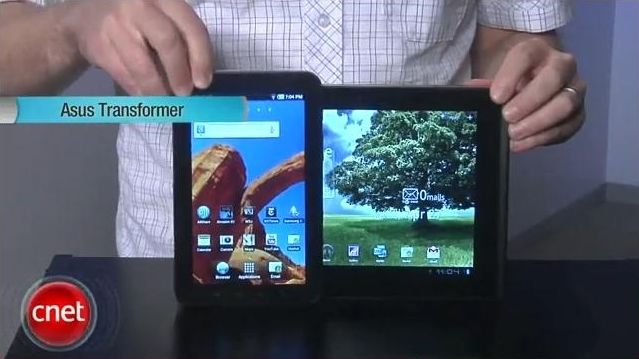 The Eee Transformer is actually slightly larger than the Xoom too! The Galaxy Tab is the same size as a Kindle 3 and a mass-market paperback book. Samsung really killed themselves downgrading the WiFi version. All they needed to do was just not include the damn 3G radios. Instead, they got greedy. Eejits. The 7″ size exists only because nobody else can get close to Apple pricing on a larger tablet with equivalent quality. People don’t want the 7″. >>>People don’t want the 7″. Not the crap ones out there and not the non-crap ones at current prices. I would say you summed up the state of affairs for the Android tablet market pretty well Mike. I recently purchased the the Samsung Galaxy Tab after previously owning an Archos 70. I sold off the Archos 70 mainly because I wanted to try something new. Although the resolution of the Archos was only 800×480, I found it adequate it for reading on a 7″ device. I think my main complaint with the Archos 70, is it only had 256k of Ram; I would flip between a browser and an app,and it would often reopen the web page once I flipped back to the browser. That doesn’t seem to be the case with the Galaxy Tab which has 512k of ram. While the build quality of Archos is cheap, it also resulted in a very light, easy to hold device. The other complaint with the Archos unit was they only allocated 256mb of space for applications. On the Galaxy Tab, I believe I have a gig. I hadn’t heard that about the Archos 70, so it’s good to find out to warn other people off it — as if the screen resolution doesn’t already do it at that price. 800×480 should be restricted to the under-$175 cheapie tablets, ideally $99 ones. 2a – Honeycomb does NOT have hard buttons (by spec) If your tablet has hard buttons, you’re buying the wrong one. 3a – True, phone apps stretch. For a LOT of apps this doesn’t matter. Apps haven’t been able to catch up to tablet design because developers haven’t had a lot of choice in decent hardware at decent prices (until last month!) I just got the Acer Iconia (AWESOME 10″ tablet, BTW) and updated my apps for Honeycomb and tablet screens. I wouldn’t touch a Xoom and it’s price / contract with a 10 foot pole, so my users had to wait. 3b – Um, no Honeycomb tablet has a low res screen that I’ve seen, so don’t compare a Chinese knock-off with a real Honeycomb tablet. There are a LOT of apps now that are made to take advantage of Honeycomb and Tablets, but Google isn’t spotlighting them. I was shocked to find that “Movies” by flixster was optimized for Tablet – Google wasn’t showing it in the Tablet Spotlight section so it’s hard to know what is already made for tablets. My own apps are now made for tablets, but I don’t expect Google to mention that either. 4a – Yep, Honeycomb would probably not be great on a 7″ screen. It’s a tablet OS, not an overgrown phone OS. I’m not sure you could click menu items on a 7″ screen very well. Think of it this way, would you be happy running Windows on a 7″ tablet? Then you probably wouldn’t like Honeycomb either. 4b – Buy a dual-core 1GHz nVidia Tegra. There’s no other actual tablet option, everything else is a knockoff by a phone company that’s always going to be running Froyo. Truth be told, if you want an Android tablet, 10″ (or maybe 9″) is about as small as you should go. Anything else will either need to run the phone-optimized version or may be tough to use with Honeycomb. >>>but Google isn’t spotlighting them. I was shocked to find that “Movies” by flixster was optimized for Tablet – Google wasn’t showing it in the Tablet Spotlight section so it’s hard to know what is already made for tablets. My own apps are now made for tablets, but I don’t expect Google to mention that either. >>>Think of it this way, would you be happy running Windows on a 7″ tablet? Again, you’re looking at the wrong tablets. If it has Honeycomb, you won’t be looking at resistive. You’re looking at last year’s technology. Don’t buy a tablet without Honeycomb. By Galaxy Tab, I expect you mean the 8.9 and 10.1 inch versions, because I don’t think we’ll be seeing Honeycomb on the 7″ one. And the highlight of the post was 7″ tablets. After posting — too long after posting — I realized I should have stated up front I was addressing mainly the 7″ ones people are finding just about everywhere today — even in chain pharmacies! I like the look of the wifi 7″ Dell Streak. Not too worried about the resolution, I’ll mainly use it for the net, I have a netbook for anything more intensive, or if I need a larger screen. I can always tether briefly if I really need access away from wifi. Dell is off my list. They eventually resolved that but never, ever again will I trust them. Mike – your post details “to a T” my five-month experience with the Archos 101. It was a nice try, but I’ve replaced the Archos with a iPad2. Because IT WORKS. I know this is a fairly old post technology wise, but I have to throw in that I’ve been using the NookColor since early December 2010 as a tablet currently running CM7.1 Gingerbread, and it works just fine. Rarely do the apps not scale correctly, and the ones that don’t have alternatives that do. Luckily almost everything has a “Lite” version to try first. I’m still holding off on buying a “real” tablet, myself, but until something with the Tegra 3 and ICS comes along in a seven inch, I’m going to be happy with the NookColor. Often, I use it instead of my laptop or desktop. Hooking up a bluetooth keyboard and running OfficeSuite Pro is super easy, and takes up hardly any space in the briefcase.